My mother recently sent me home with some frozen blackberries from her freezer, and I was in a scone-baking mood anyway so that cinched it. Then, I realized I had some whipping cream in the fridge leftover from another recipe, and I wondered what it would be like to substitute that for the milk. 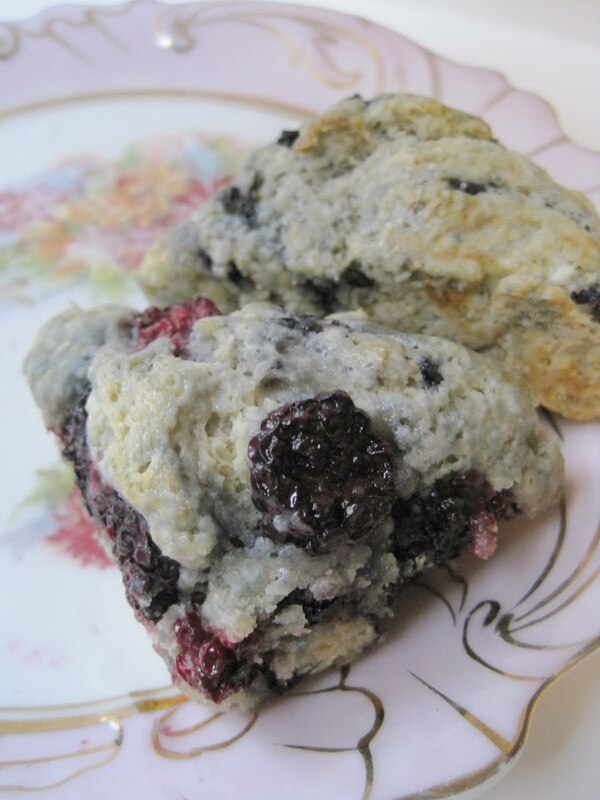 The result was a wonderfully light and moist scone, and is there any taste better than a hot berry bursting in your mouth? Mmm! 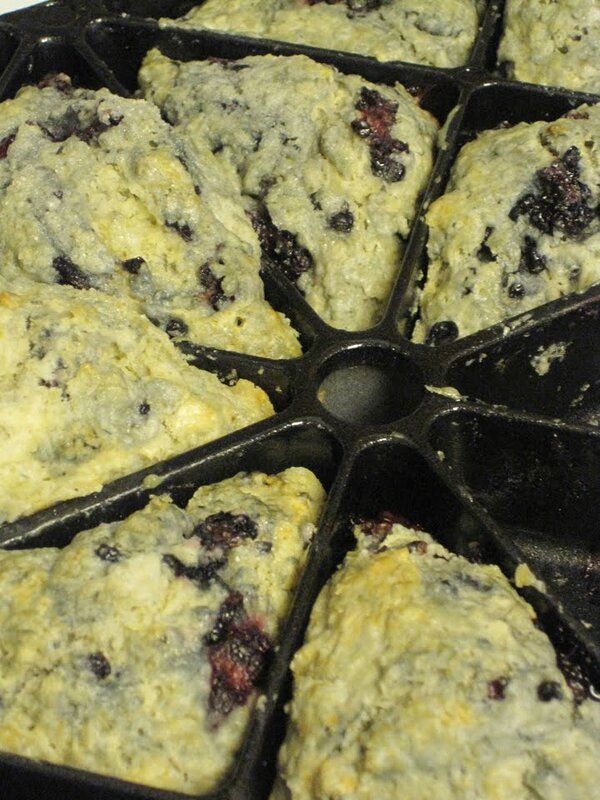 Preheat oven to 400 degrees and spray a scone pan with cooking spray. In a large mixing bowl, combine flour, baking powder and baking soda. Add 6 tablespoons of chilled margarine and combine using a pastry blender until the mixture consists of pea-sized crumbs. Stir in berries. In separate bowl, whisk whipping cream and egg. 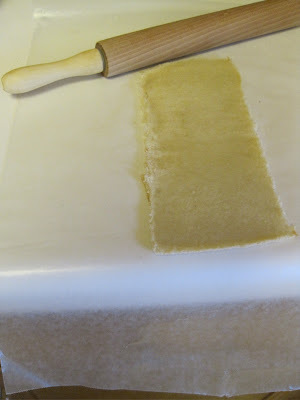 Add to dry ingredients and stir just until blended. 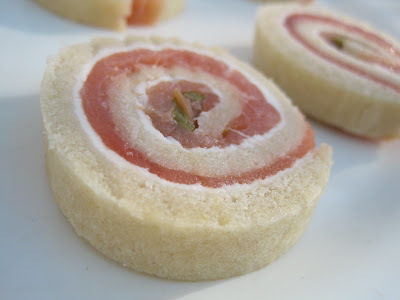 Spoon batter into pan and bake for 17 minutes or until lightly browned. Yields about 8 large or 16 mini-sized scones. Last year saw the release of Trish Perry's delightful first novel in the Tea with Millicent series, "The Perfect Blend." 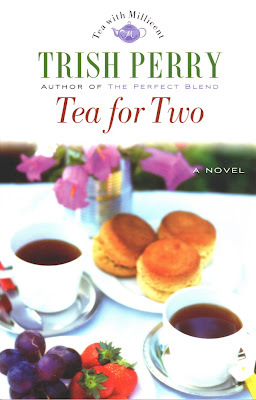 Over the weekend I finished reading the second release in the series, "Tea for Two," and again I was absolutely charmed by this inspirational romance novel. 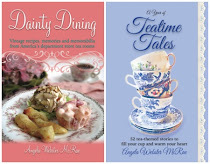 In addition to the beloved tea room owner, Millicent, each of these novels so far has featured a strong heroine and an intriguing plotline that keeps the reader turning pages. In this novel, Millicent becomes concerned about her tea room's produce supplier, Zack, a single father who is suddenly having trouble with his two teens. One of Millicent's regular customers is a professional counselor, Tina, whom she believes could be of some help to Zack and his family. Does she mean for that help to be professional, personal or both? Hmmm. 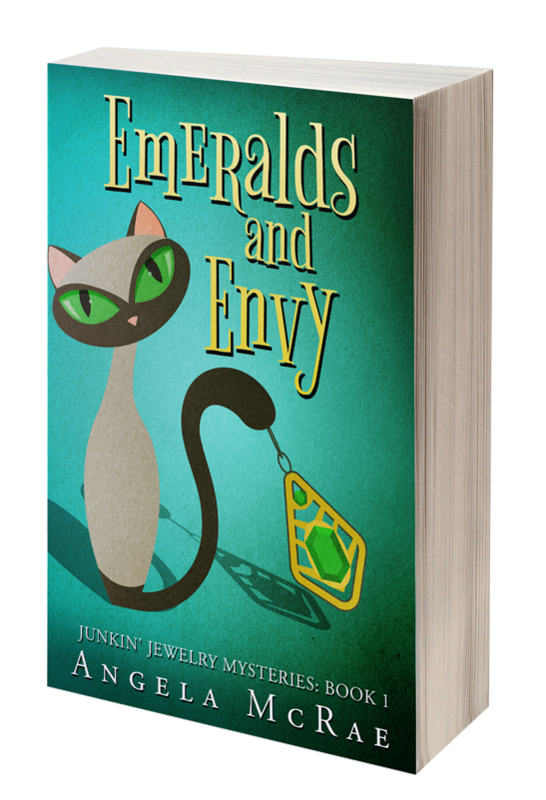 Tina and Zack are both likable characters, but the author doesn't reveal too much about them at first. Both appear to be holding back something, and both seem to have relationship fears based in the past. (And as someone who was single for a long time before marriage, I very much enjoyed reading about some of the "Mr. Wrongs" Tina had dated! I know those guys!) 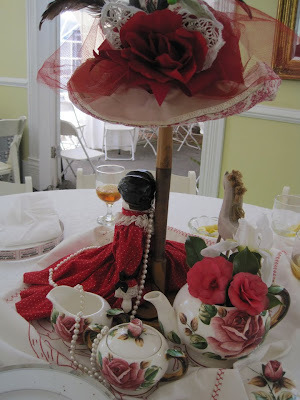 I think I probably would have enjoyed this story no matter where it took place, but having it center around a tea room whose owner makes things like Chicken Curry Tea Sandwiches and Malted Chocolate Mousse Cake made it even more enjoyable. 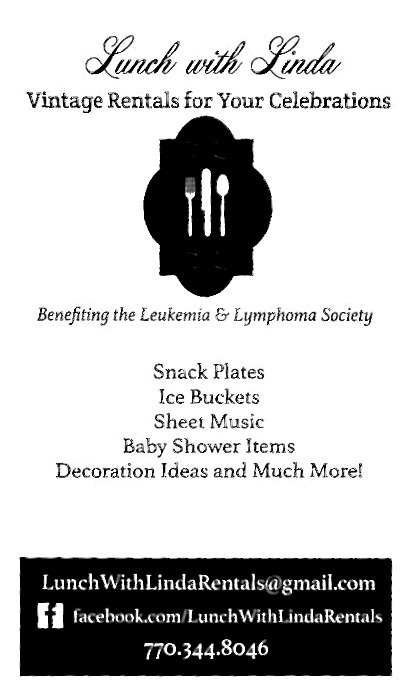 (Blessedly, recipes are included.) If you like Christian fiction, I can't imagine you won't like this book! 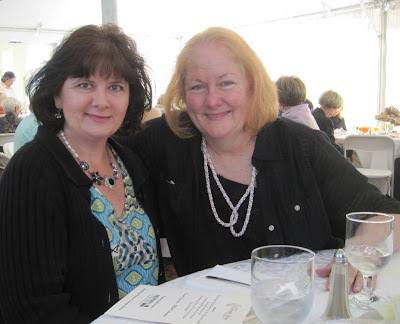 Find out more about author Trish Perry here. Today is March 29. A month from today will be April 29. And what will many of us be doing on April 29, friends? Watching the wedding of Prince William and Catherine Middleton, of course! 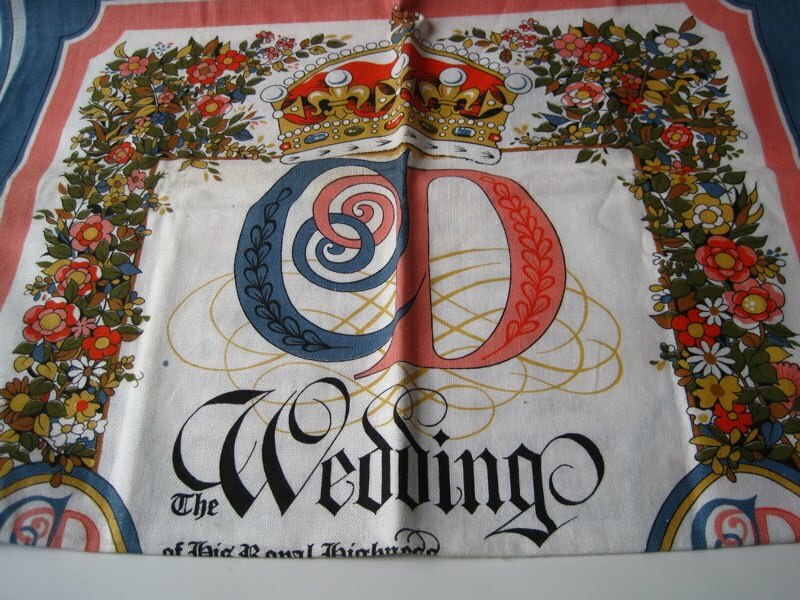 Happily, details of the event are starting to come out, and yesterday I read an article in The Independent about the royal wedding's cakes. 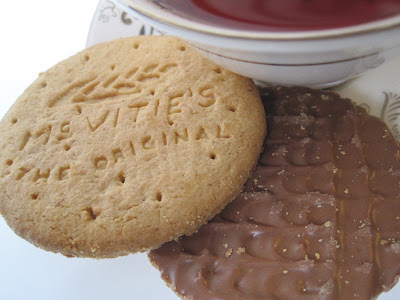 One requested by Prince William will feature McVitie's popular tea biscuits, or cookies as we call them here in the U.S. 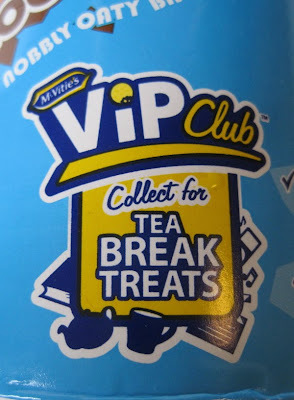 These McVitie's treats above came from Publix, which stocks several varieties of British treats in the ethnic foods section. Alongside a cup of Peppermint and English Toffee tea in my commemorative teacup from the Princess Diana exhibit, this was a royally good afternoon treat! 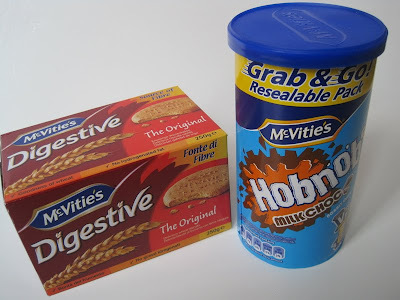 I got the "Digestives," the tasty cookie which tastes like rather a cross between an animal cracker and an oatmeal cookie, as well as the chocolate covered "Hobnobs." 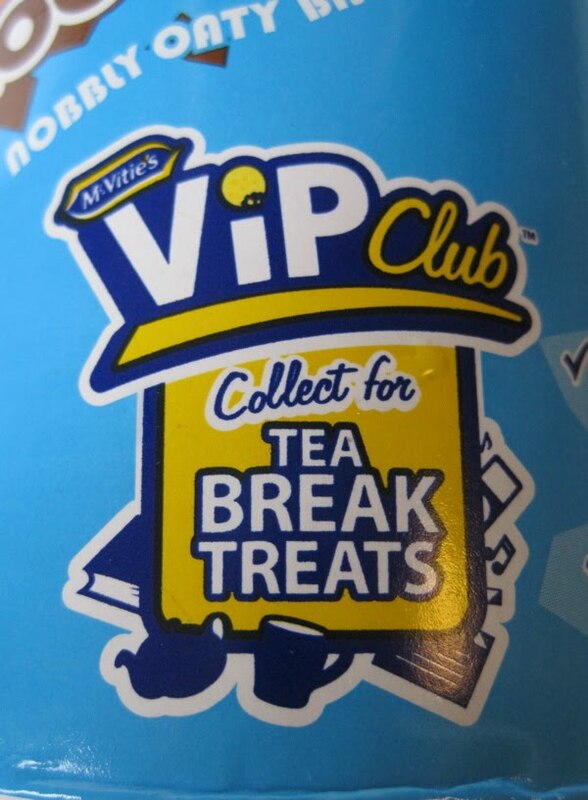 Now if we lived in the U.K., we would be able to sign up for their fun VIP Club and earn "Tea Break Treats" with our purchase of the Hobnobs, but alas, that loyalty program isn't available to us. Too bad, because I would dearly love to earn points toward one of their tea mugs or teapots being offered, and I'm sure some of you would as well! For now, however, I'll enjoy my treats and look forward to April 29. Are any of you fans of McVitie's? If so, you may enjoy this video with McVitie's about their plans for Prince William's Royal Wedding reception cake. Loretta J! 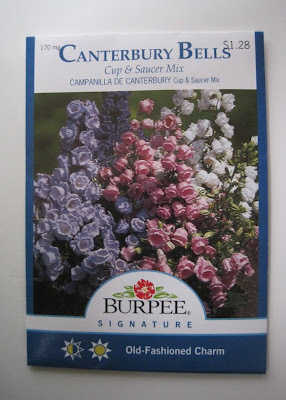 If you'll send me your snail mail address via the e-mail button at right, I'll get these in the mail to you! Congratulations! Now I expected a few of you might be interested in a little "tea gardening" information, but I was delighted to learn that so very many of you are as interested in gardening as I am! As you can see here, I've already got some of my peat pellets planted with seeds, including some tomatoes and some Rose Bon Bon Double Cosmos. 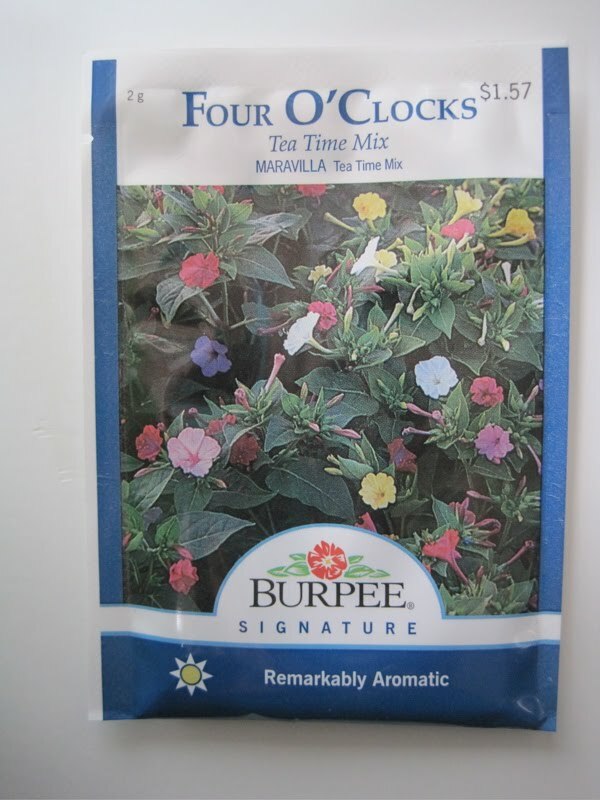 My theory is that anything that sounds like it could be served at "teatime," such as bon bons, can go into the tea garden! 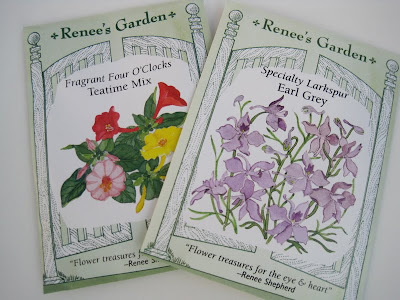 I was at Lowe's looking at seeds last week when I learned that they, too, had some varieties that are particularly well-suited to the tea garden, and I got two of each, one for you and one for me. These varieties, from Burpee, include Canterbury Bells, the Cup and Saucer mix. And they also had a variety of Tea Time Four O'Clocks. Want these two packets? Just to try something a little different, the FIRST person to tell me they want them today gets them! 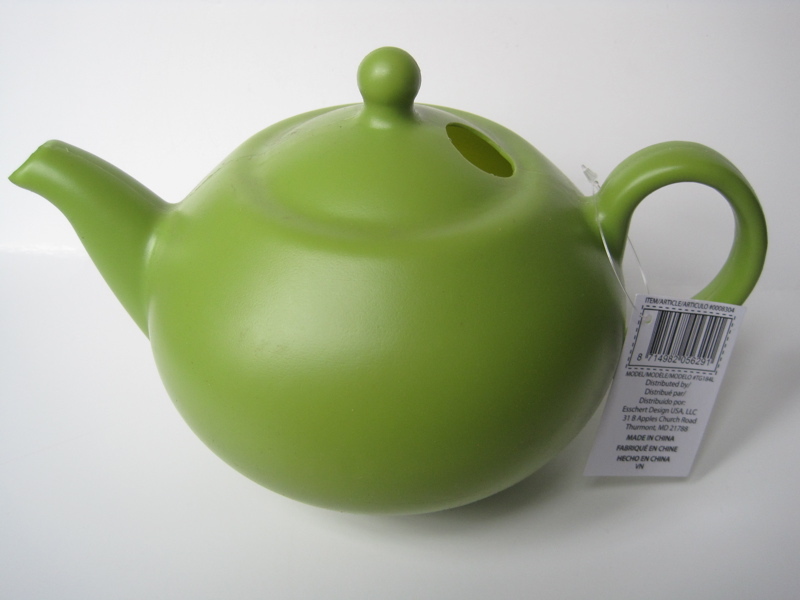 I imagine lots of us live near a Lowe's, and if you go I should warn you they also have a cute little plastic watering can in the shape of a teapot, but it's basically $6.97 for a cheap piece of plastic designed to lure in unsuspecting tea loving gardeners. Really, what sort of sucker would fall for that? 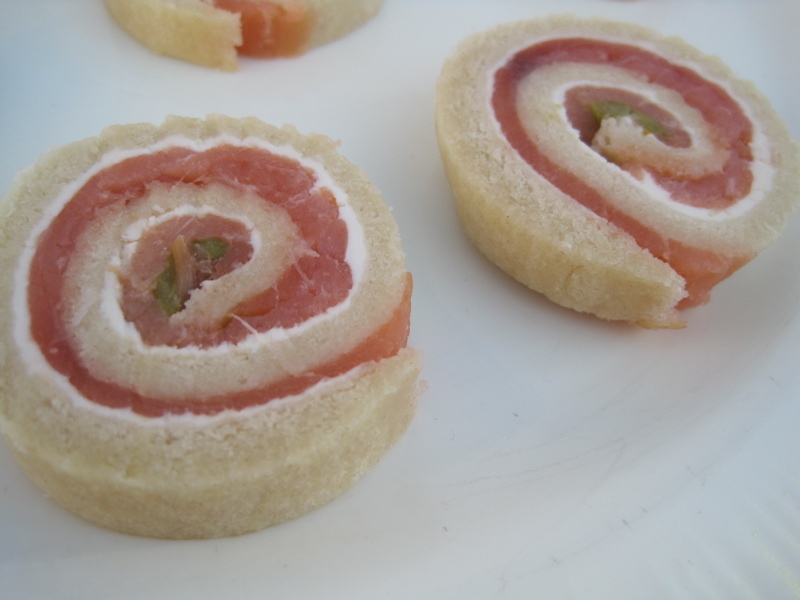 An old copy of Canadian Living magazine shared by my friend Maureen was the inspiration for this week's tea sandwich, Smoked Salmon & Asparagus Pinwheels. 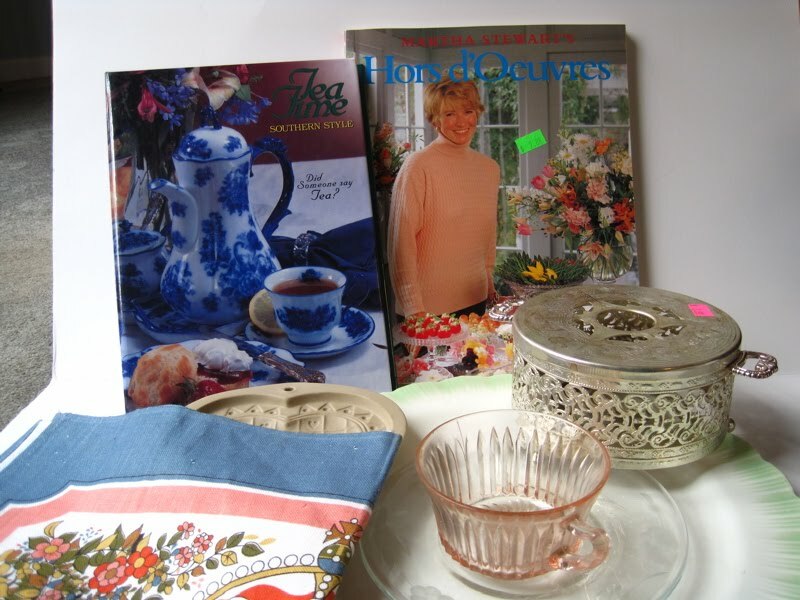 The magazine had featured a great article on different ways to make tea sandwiches, and the shape and substance of these greatly appealed to me! 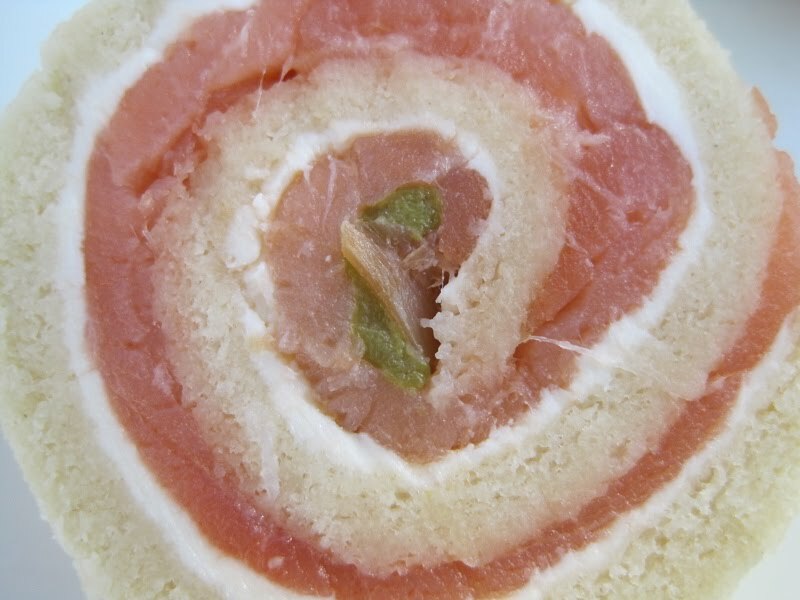 First, you'll need an unsliced loaf of bread. I bought the Original Recipe English Muffin Bread from Publix, a variety I've never noticed before. It sliced beautifully, and I was then able to flatten the long bread slice with a rolling pin. 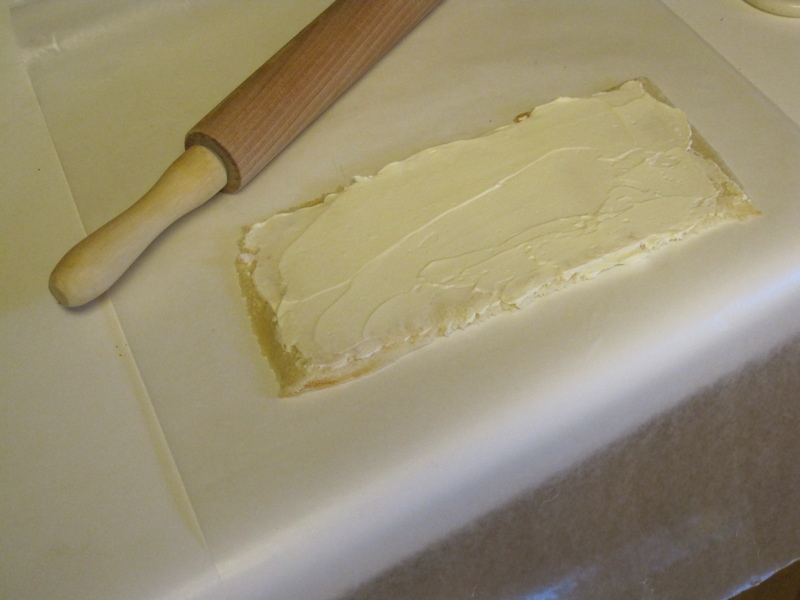 Next, I spread a layer of a cream cheese/mayonnaise mixture. 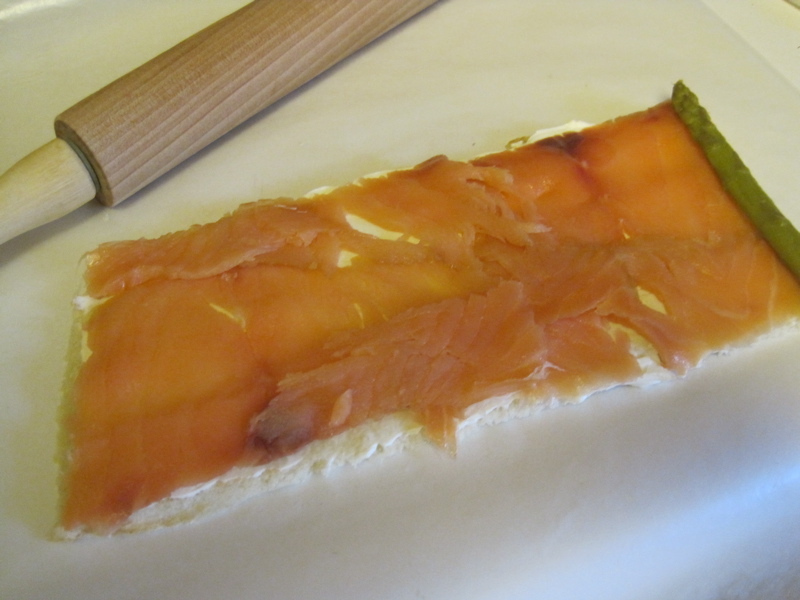 Thin-sliced smoked salmon was layered on top of the cream cheese, along with a single asparagus spear at far right. 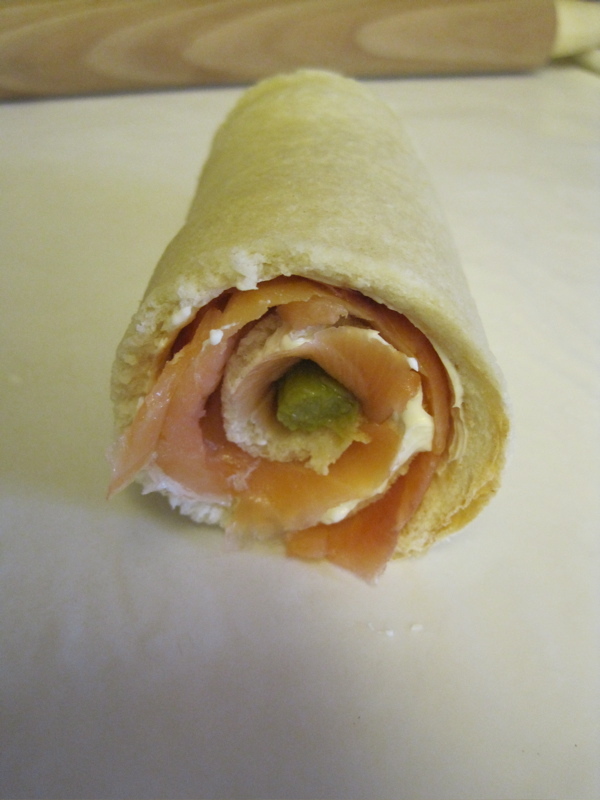 It all rolled up nice and easy! To make sure the pinwheels held together, I tightly wrapped the roll-up in waxed paper, twisted the ends, and let it sit in the refrigerator for several hours while I was at work. 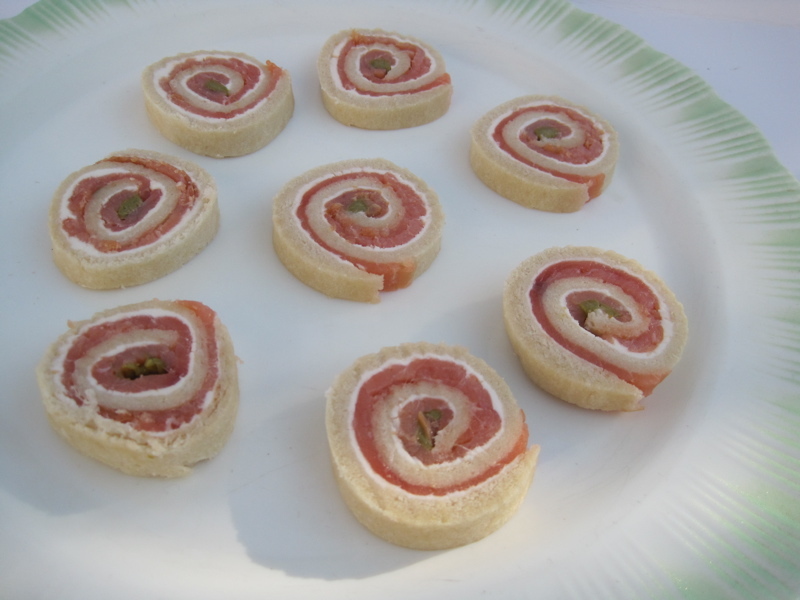 That evening, I came home and was quickly and easily able to slice up the pinwheel sandwiches, which are just incredibly easy and delicious. I love that this can be a "make ahead" sandwich for teatime. Perfect! Now here's the recipe. Enjoy! (See directions above.) Yields 24 sandwiches. 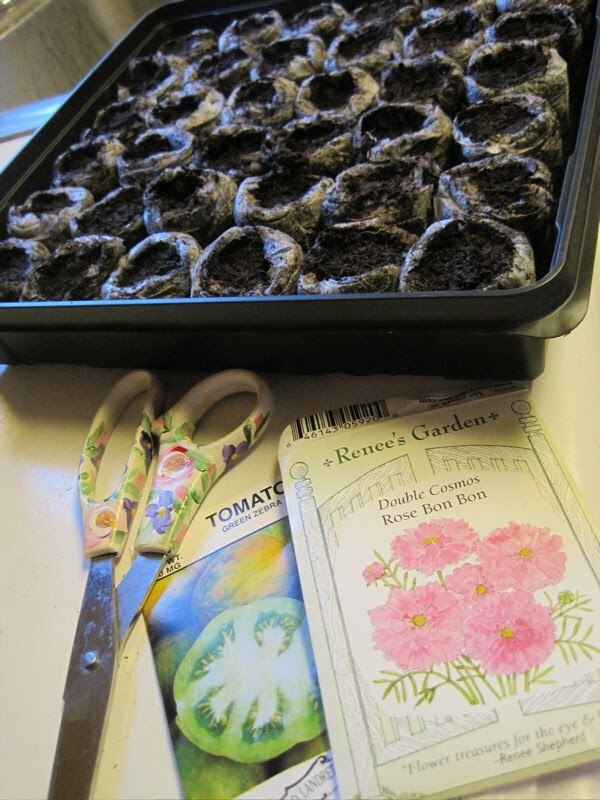 Last year was the first year I tried growing plants from seed, and I was very pleased with the seeds I got from Renee's Garden. 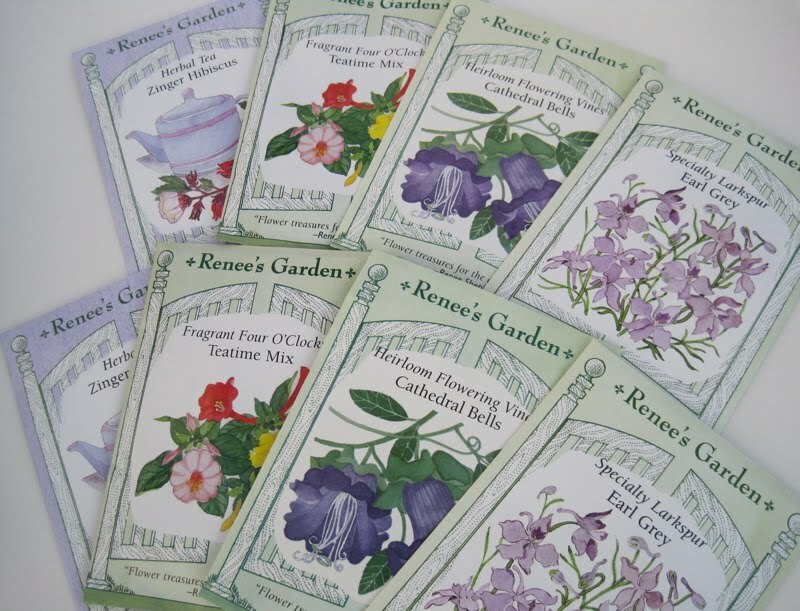 This year I'm again going to plant some Renee's Garden seeds, thanks to the company's kind offer to send me some sample packets. What will I be growing? 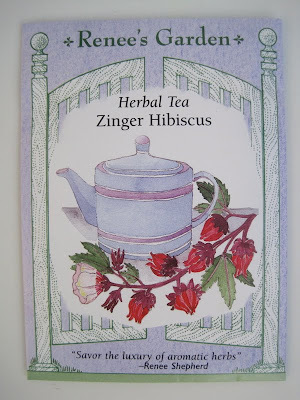 I'm perhaps most excited about a new introduction, Zinger Hibiscus which can be used to make herbal tea. Continuing the tea theme, I'll be planting Teatime Four O'Clocks and Earl Grey Larkspur. 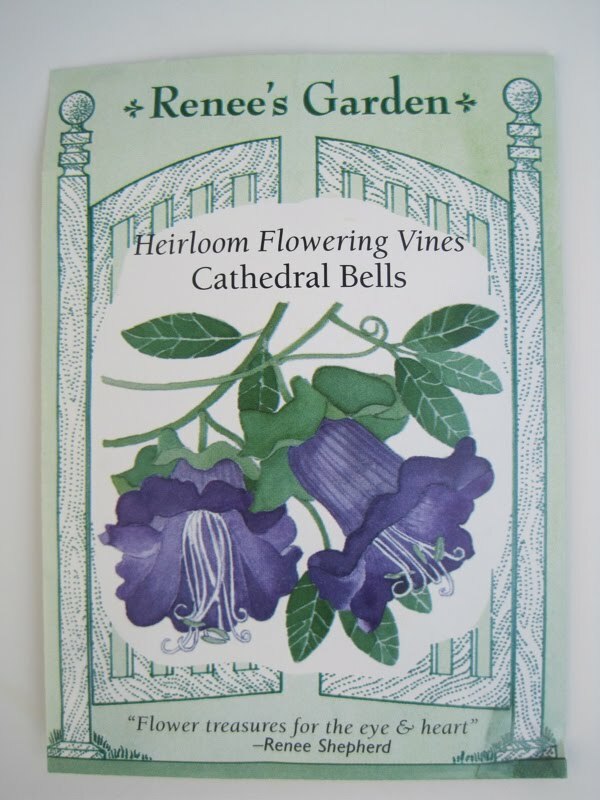 And you may wonder about my choice of Cathedral Bells, but this plant is also known by another name. 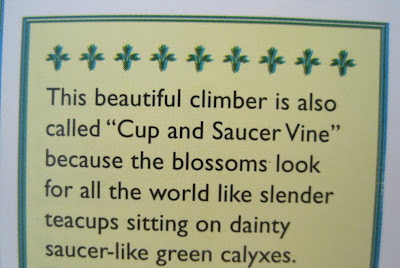 Who wouldn't love to have Cup and Saucer Vine growing in the flower garden? 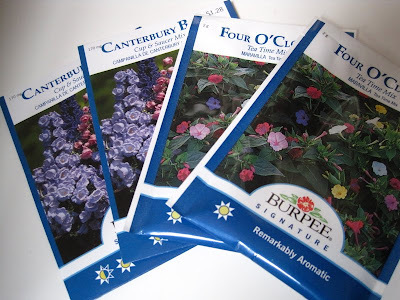 If you'd like to win these four seed packets and give these plants a try, just leave a comment between now and Monday at 7 a.m. EST. 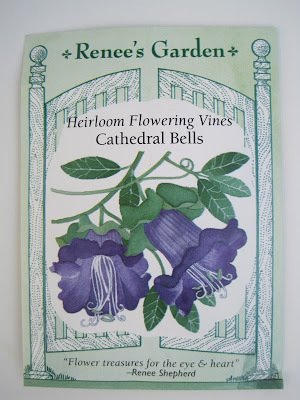 Good luck and happy gardening! Even though I visit Cracker Barrel about once every month or two, clearly my tea radar isn't always working. Otherwise, how could I possibly have missed seeing this cute pink Tea Shirt that tea friend Janet in Texas alerted me to! 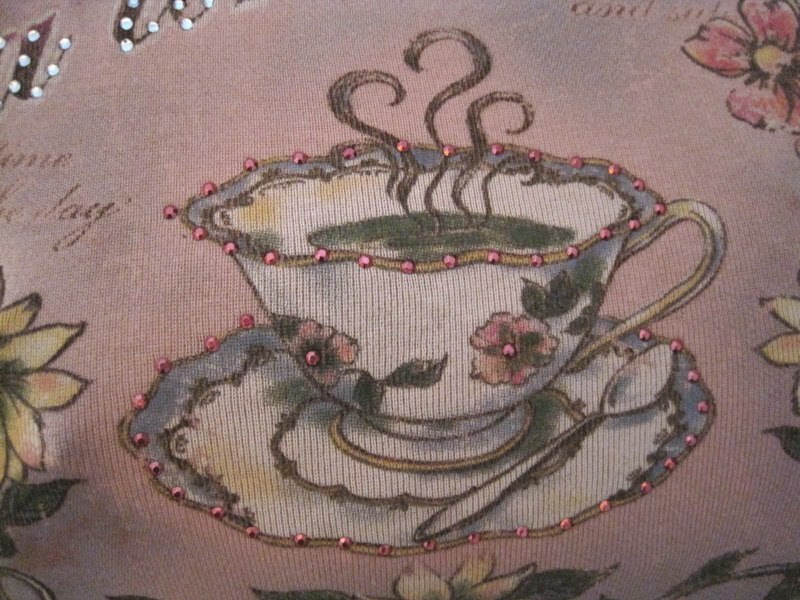 I love the teacup, and I love the faded pink hues. 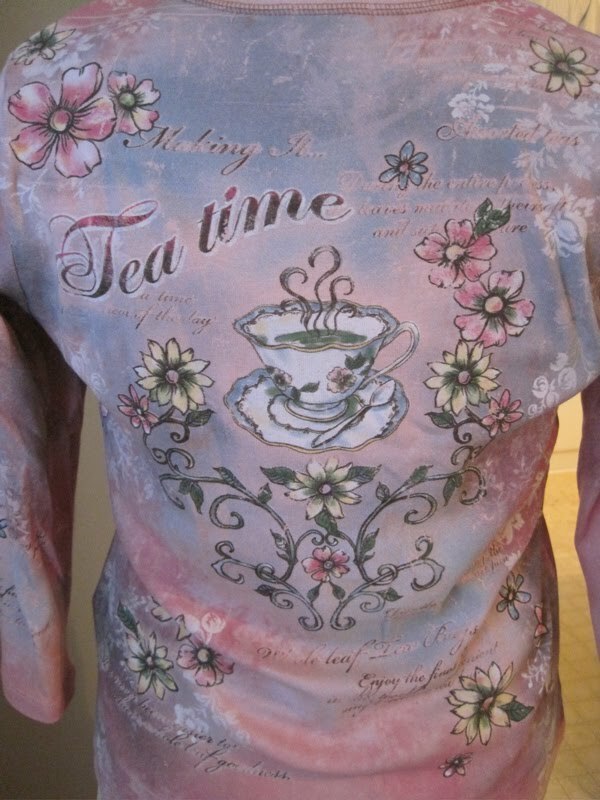 This is the back of the shirt, which is being modeled by Matilda, the mannequin which displays all my tea-themed pins. The shirt's even got a little bling to it. 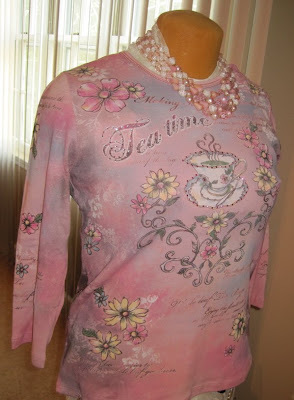 So if you're visiting your local Cracker Barrel, it may be time for a wardrobe addition! Finally! After a couple of very "dry" months of antiquing and junking, I finally had a successful weekend! Here are the goodies this weekend yielded. First, on the way to my parents' house I stopped in Carrollton since my mom had found a new store there she said I ought to visit. I can't remember the name (it was something long), but for locals who'd like to visit, I can tell you it is located in a corner of the shopping center behind the Sonic restaurant on Bankhead Highway. It's the kind of place where you have to carefully wedge in between the rows of incense and plastic rings to find the vintage books, old teapots, tole trays and more. My treasures included a brand spanking new copy of Martha Stewart's "Hors d'Oeuvres" ($2.88) and a teapot warmer ($3.88) which later cleaned up nicely. Those are two things I had wanted but was not willing to purchase at full price. Good things come to those who wait! 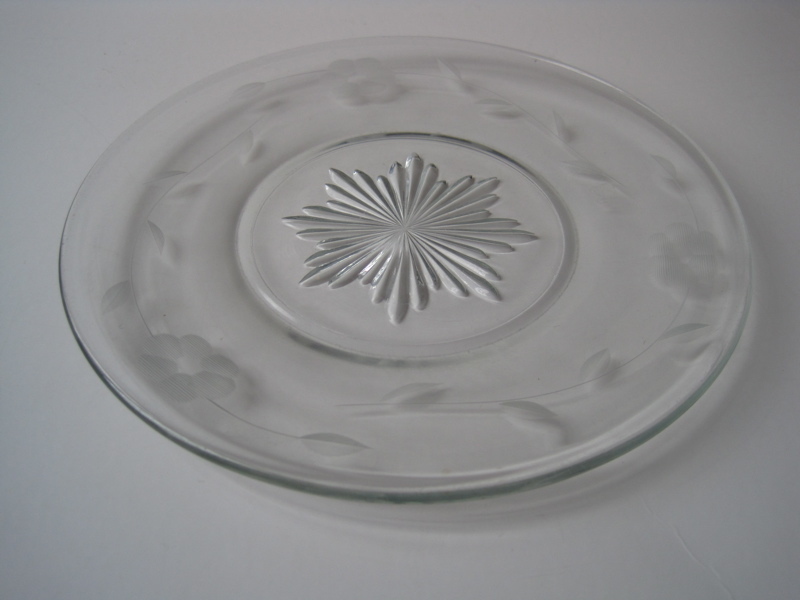 When I got to my mom's, she had found this large (11-1/2-inch) Depression glass platter with a tinted green rim. Loved it! 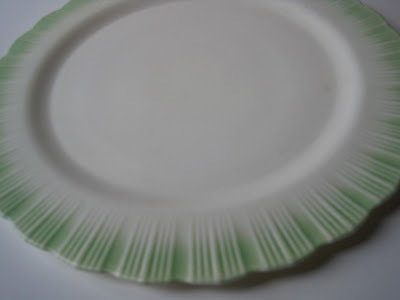 Said it was $1 at a thrift store she visits, because they let *men* price the dishes there, and she's observed that no matter how nice the old dish, the men put $1 on it. She visits that aisle first thing when she visits that store! So when we got to Anniston, she asked if I'd like to visit that thrift store. Sure! 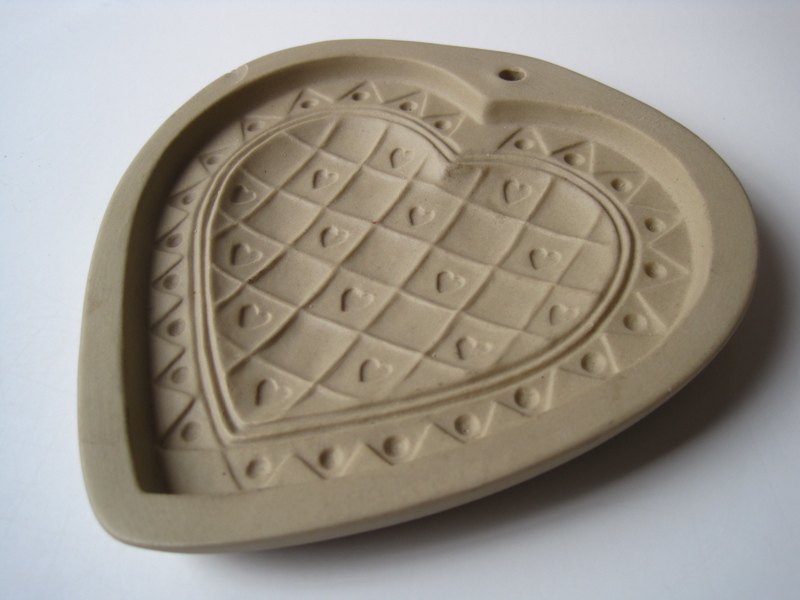 I found a Brown Bag cookie mold (these have become quite collectible) for just $2. At one of the antique malls, the finds included an etched glass plate for $1, which I thought would come in handy for "styling" my Tea Sandwich Saturday posts. I *thought* I had found a cup in the Coronation Depression glass pattern, but later learned that no, this one is Queen Mary. Live and learn. At least it was cheap! And I guess I had royalty on the brain, because I also found a tea towel from the wedding of Prince Charles and Lady Diana. 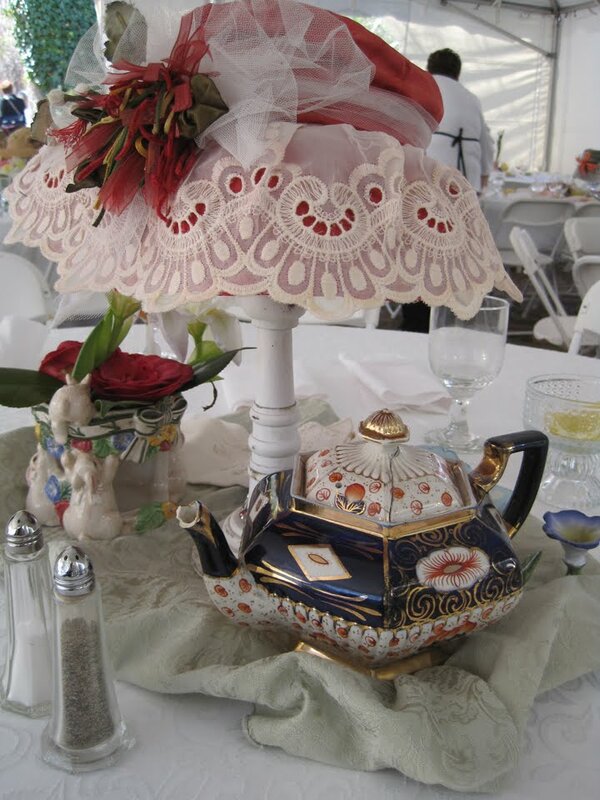 That will come in handy when decorating for my Royal Wedding Tea. 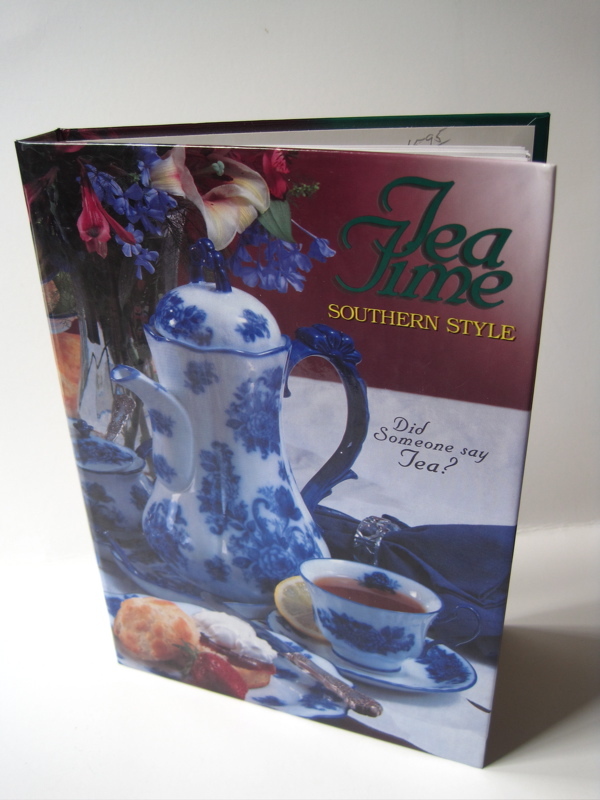 Last but not least, I found a copy of "Tea Time Southern Style," a cookbook I'd wanted, for just $5. At this antique mall, I was joined by my five-year-old niece Amelia. Now, I would not take most five-year-olds I've known to an antique mall, but Amelia is a wonderful little shopper and is also currently on a "Little House on the Prairie" kick. She loves to look for things from "The 1800s," which she says with the same reverence most little kids say "Walt Disney World." (Example: "Angela, is that old hairbrush from The 1800s?") 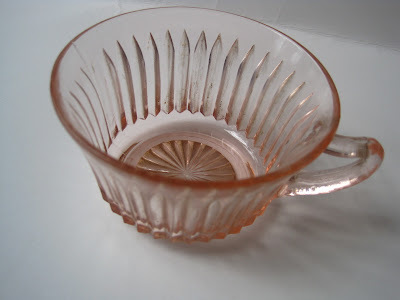 I had asked Amelia to help me look for pink and green glass, and she got very good at spotting it before I did. Sometimes, we were looking in tightly spaced little booths. Once I said "Goodness, we better be careful in here." Amelia: "I'm doing my best!" And you know, she was! 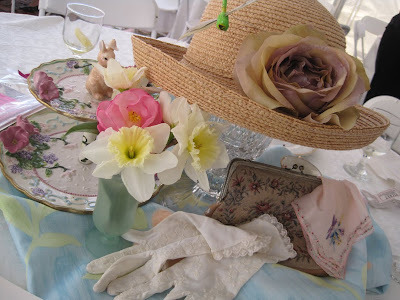 The funniest thing was when I picked up a green Depression glass cup and saucer and Amelia asked how much it was. It was $45 and she exclaimed, "Holy cow! Put that down RIGHT now!" And I did! But the $5 cookbook got her OK, so I came home with it. 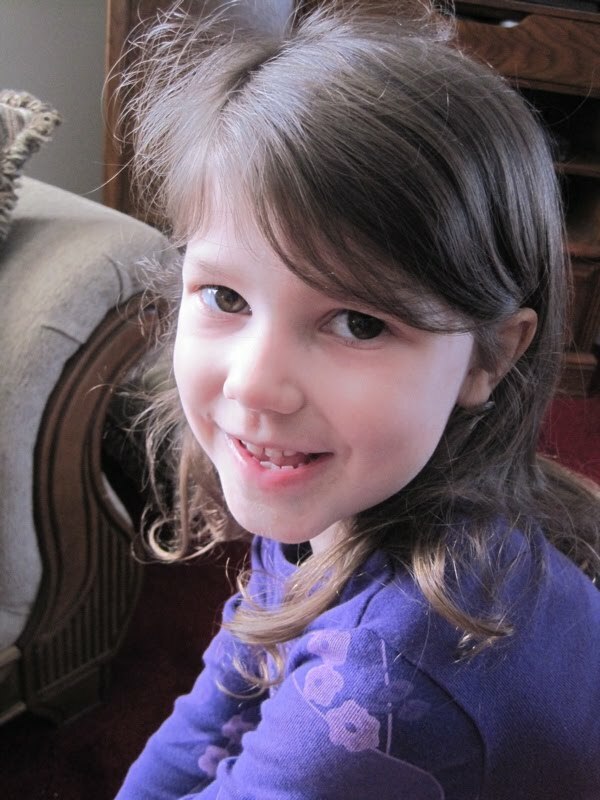 And here is a recent picture of Amelia, just to give you a visual image of my personal shopping assistant! I'll end on a random note: We were at one antique store where my mother was inside paying for some inexpensive metal plates that Amelia thought looked like they came from -- say it with me now -- "The 1800s." 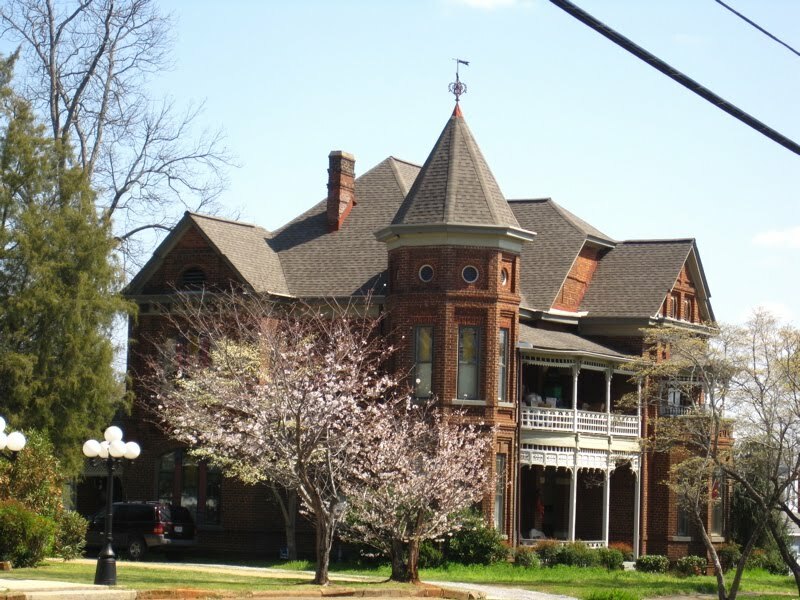 I was outside on the porch and across the street was this house. 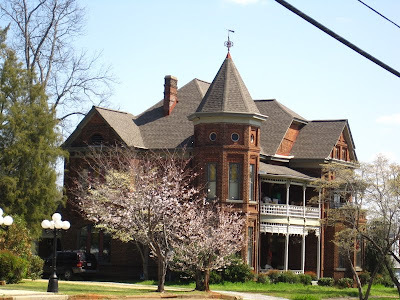 Because of all the stuff outside on the porch and balcony I couldn't decide if the residents were moving in or moving out, but wow, isn't this house something! What a fun, and productive, Saturday! 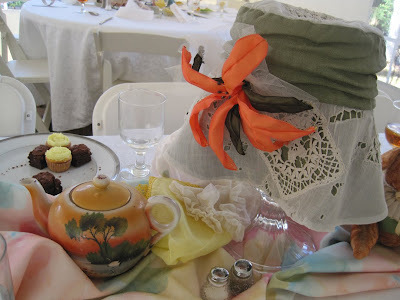 The table decorations at the Fashion Luncheon I wrote about yesterday were so cute I wanted you to see them, so as soon as the women started clearing out I whipped out my trusty Canon PowerShot and started snapping photos! 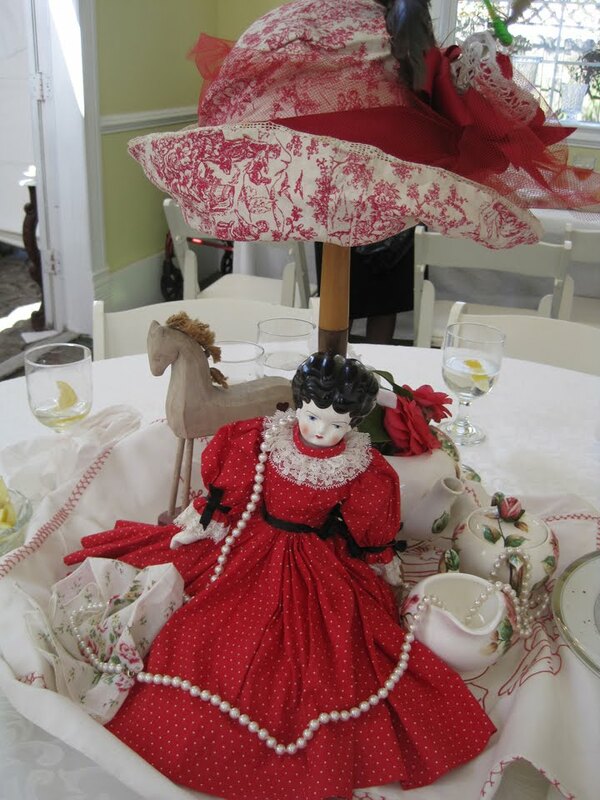 Someone did a really nice job of coordinating the colors of this teapot and the hat, don't you think? This elegant teapot was one of my favorites, and upon closer inspection I noticed a chipped spout and a crack or two, but yet this piece obviously still has sentiment for someone, and I like that! ... you can see soft red roses on the teawares. Nice! 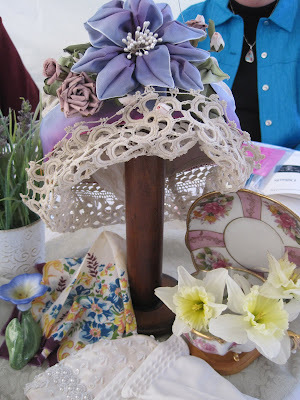 Isn't this hat beautiful? 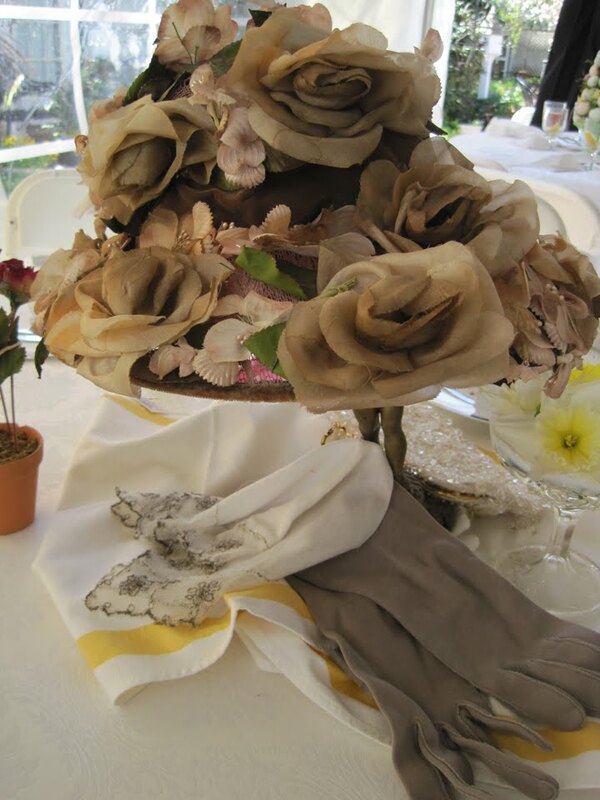 I thought the attractive taupe palette made this quite a lovely centerpiece. And finally, the afternoon light was streaming through the window behind this bunny rabbit, and he just seemed to be saying, "Take my picture, please ..." So I did! Sandra of the "Books and Grandchildren" blog! If you'll send me your snail mail address (see button at right), I'll get these treasures headed your way. And if you didn't win this time, I'll be giving away another batch of these goodies next month, so stay tuned! Last weekend, I attended a special fundraising event whose guest speaker was Mildred Huff Coleman, above, author of "The Frances Virginia Tea Room Cookbook." 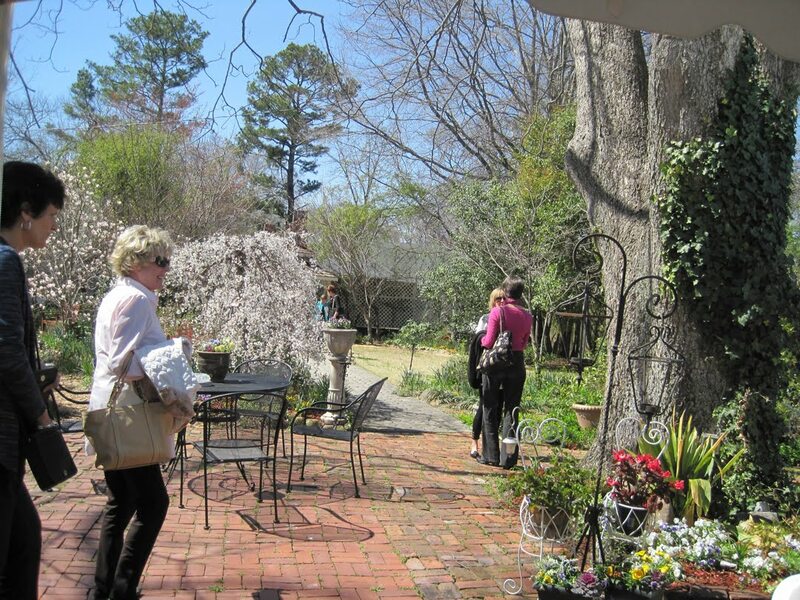 The Frances Virginia was a famous tea room that operated in Atlanta until the sixties. 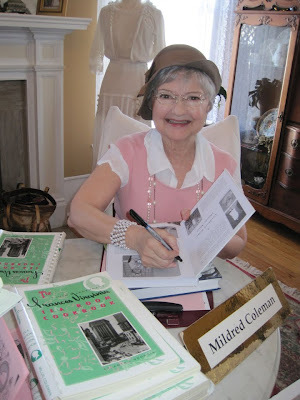 I've had the pleasure of meeting and/or interviewing "Millie" several times, so now I actually consider her a friend and was delighted she was speaking at Something Special in Newnan, which itself was a former tearoom but is now a special events facility. 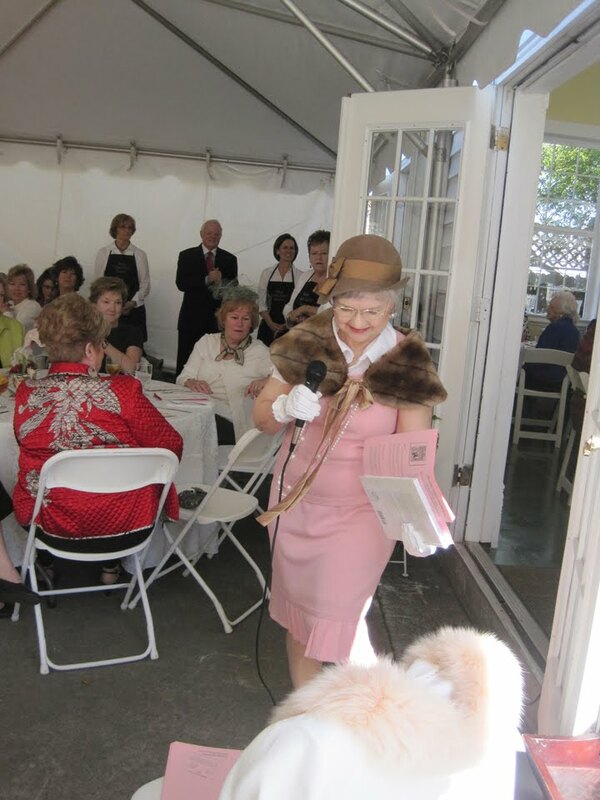 The occasion was a fun Fashion Luncheon staged by the Newnan Carnegie Library Foundation, whose volunteers did a terrific job. 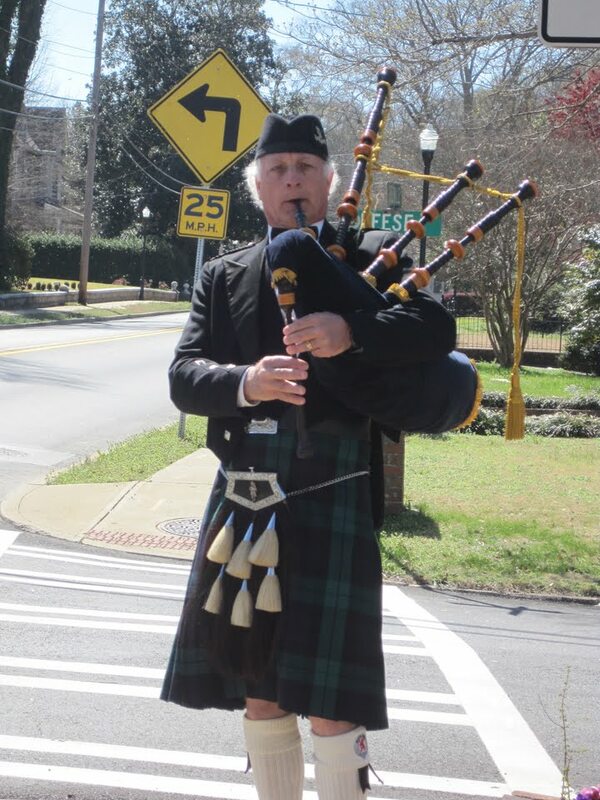 As guests arrived at Something Special, we were greeted by lovely music from a local bagpiper! 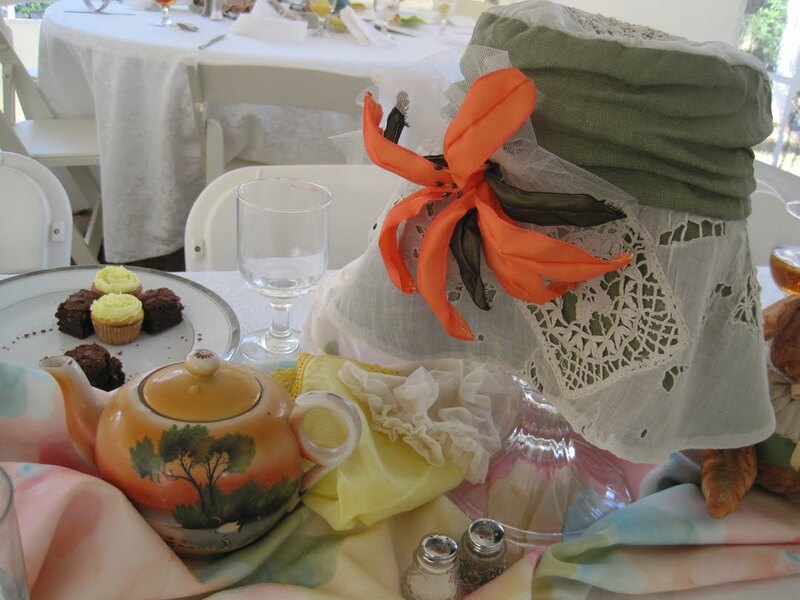 The ballroom and a tent at the special events center had been transformed into an elegant tearoom for the day, and each table featured teawares, hats and gloves. The centerpiece at my table was especially fun because I have that exact same footed pink teacup! Another reason this luncheon was so enjoyable was that I finally had a chance to catch up with my sweet friend Joanie, at right. 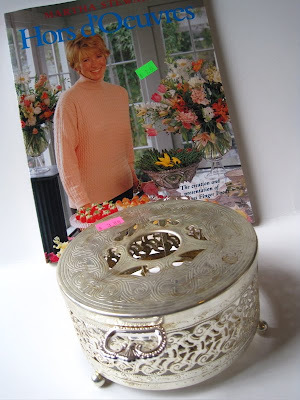 Joanie is a frequent commenter here (and perhaps my greatest cheerleader! ), so I thought some of you would enjoy being able to attach a face to the name! 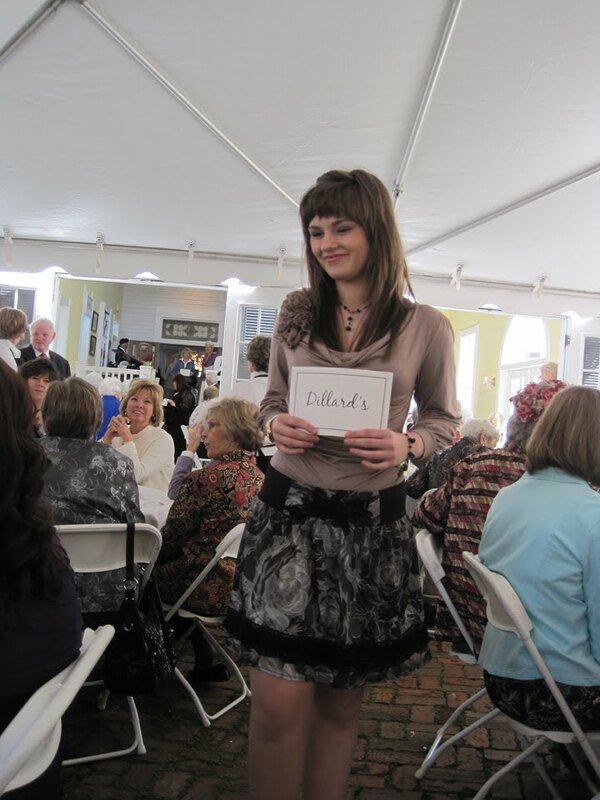 Other fun visitors I came across included my young friend Michelle, one of the volunteers who modeled spring fashions. 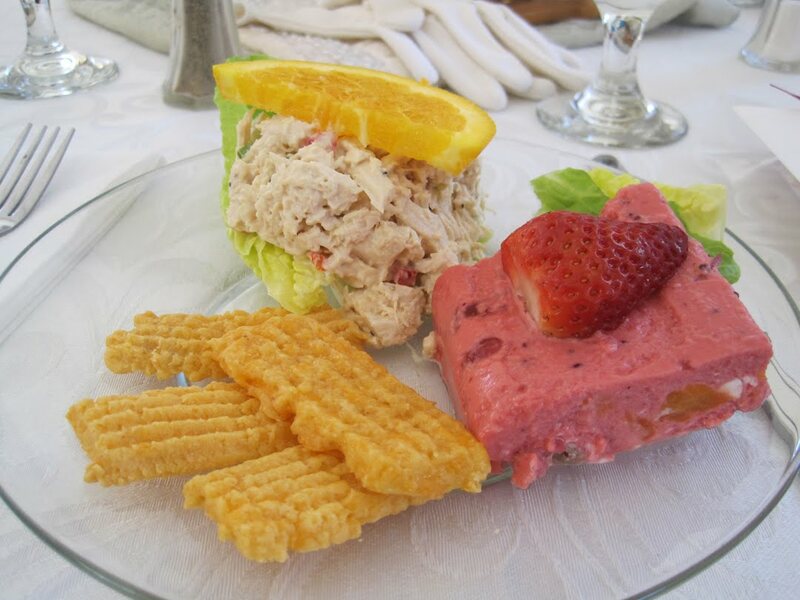 Michelle was one of the servers at the former Holly Cottage Tea Room her mother owned. I've missed seeing her (and her mother and grandmother!) and was so pleased to find her at this event. 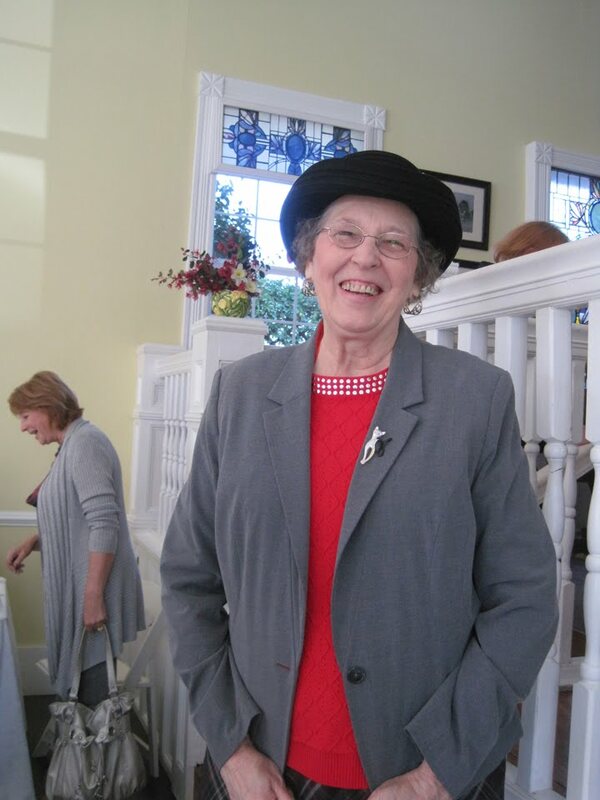 Another surprise face in the crowd was Martha Sue McCain, a beloved woman who once ran Something Special Tea Room with her mother. How perfect that she would return to Something Special for this event! As if all that weren't enough, guests were welcomed into the beautiful gardens at Something Special following the luncheon. I've been a little too chatty today, but if you'll join me tomorrow I'll show you some of the great teawares and centerpieces from the luncheon! A new Kimberly Shaw stationery giveaway! 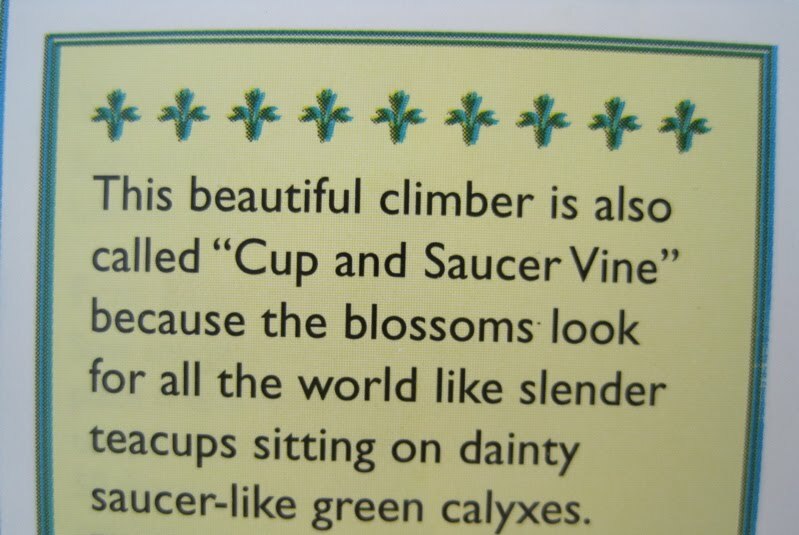 The Aqua Cup Tea Co. 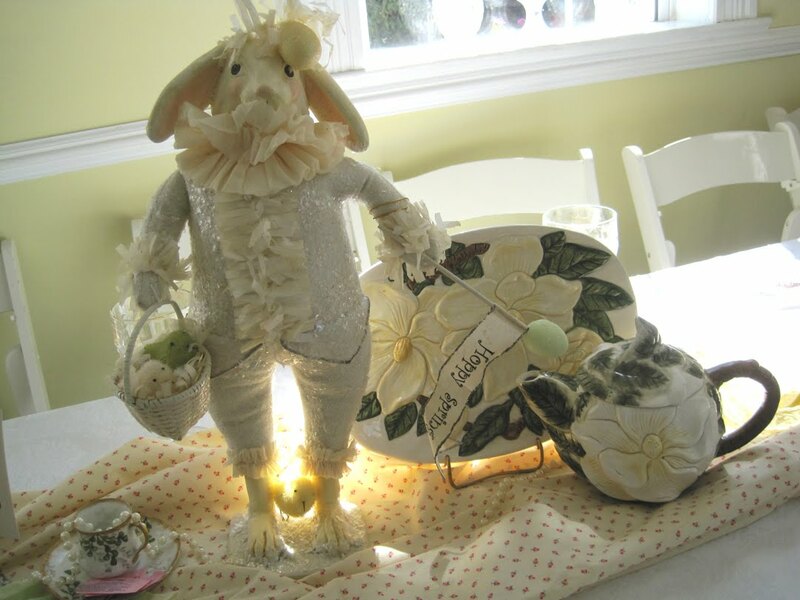 Win a copy of Laura Childs' "Scones & Bones"! 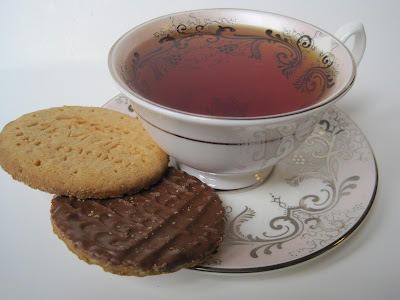 A Cuppa Chocolate Tea, anyone?